(ST. LOUIS, MO) For St. Louis SLAM fans that purchased a ticket for the team’s post-season opener at St. Mary’s High School Saturday night, they certainly received their money’s worth. 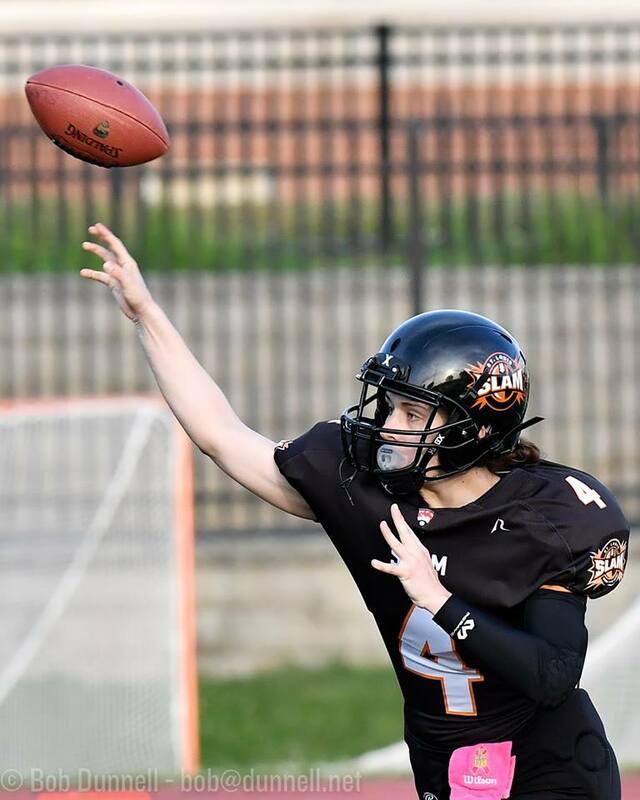 For the defending Tier II National Champions of the Women’s Football Alliance (WFA), double-digits recorded in the touchdown column was the highlight. 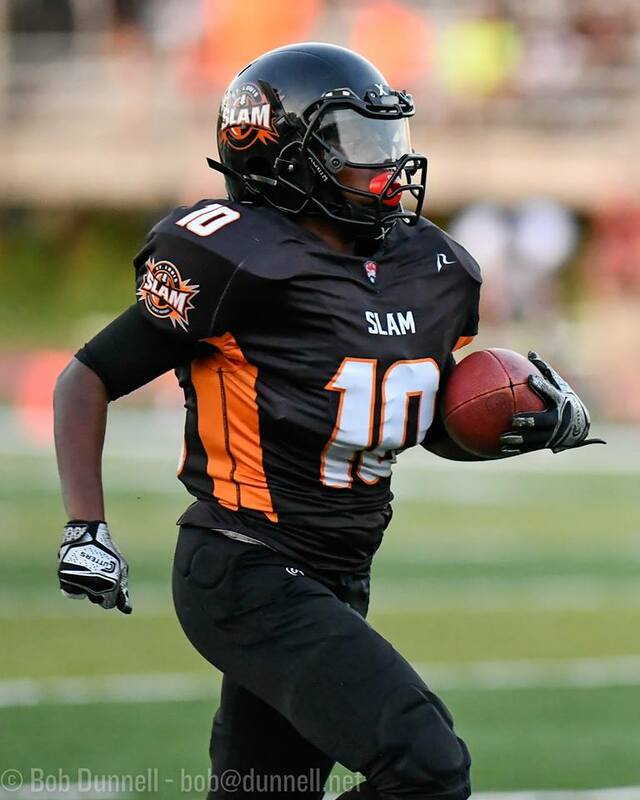 Propelled by a 34-0 second quarter push, the SLAM smothered the Madison Blaze, 69-8, in a WFA Tier II National Quarterfinal. With the win, St. Louis (8-1) will host Denver, Colorado’s Mile High Blaze in a semifinal game at St. Mary’s on Saturday, July 8. Mile High (9-0) topped the Sin City Trojans, 28-14, Saturday night to reach the WFA Tier II Final Four. Six St. Louis players collectively scored the team’s ten touchdowns for the evening, paced by running back Taylor Hay’s trifecta of end zone romps. 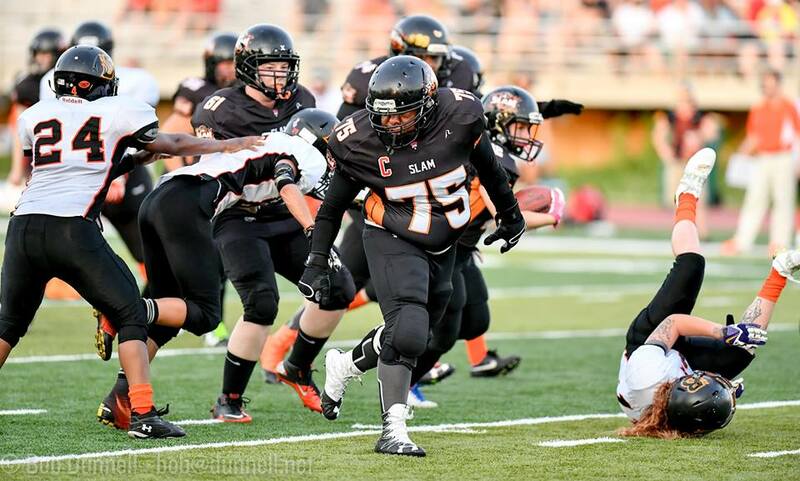 There were so many layers to the SLAM’s Saturday night arsenal, including an offense that collectively accumulated 502 yards on the turf and a defense that played three quarters of shutout football. 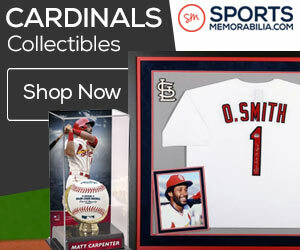 As defending champs, St. Louis is fully aware that they are the hunted from here on out if they wish to reach the Tier II Championship game in late-July and potentially hoist back-to-back trophies. Early in the first quarter, the SLAM gained possession off of a Madison fumble and quickly converted it into points. Danielle Price’s 15-yard scamper drew first blood and with Taylor Hay’s successful PAT kick at the 13:10 mark, the locals held a 7-0 edge. The SLAM’s defense, paced by Myrt Davis, Keyonna Smith, Kaylee Neutzling, Jelani Kelly, Raven Williams, Brooklyn Bastain, Victoria Nichols, Tiffany Pugh, Robyn Morrow, Pamela Green, Annie Grier and Antonnia Washington, quickly doused the Blaze, resulting in a Madison turnover off of downs. Following the switch, the SLAM churned a seven-play, 36-yard scoring drive that was capped by Smith’s nine-yard romp at the 5:30 mark that pushed the lead to 14-0 following Hay’s successful kick. 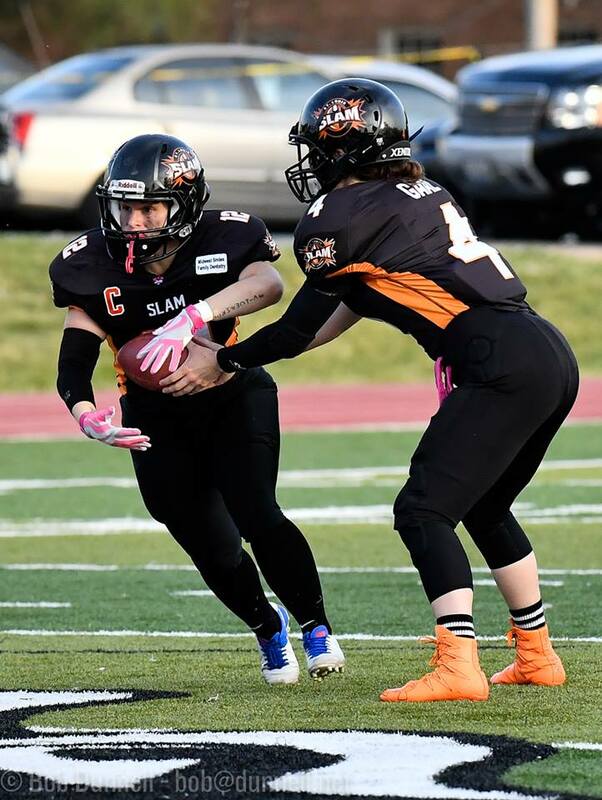 As the quarter progressed, the Blaze (4-5) displayed moxie and scored as Kara Haines collected a 34-yard touchdown run with two minutes left. A successful two-point conversion followed as Madison sliced the SLAM’s lead to 14-8. As the half trickled over into the second quarter, St. Louis cobbled a nine-play, 52-yard scoring sequence. Hay notched a five-yard touchdown run at the 12:15 mark and booted the extra point that extended the SLAM’s lead to 21-8. Madison attempted a return salvo on their next possession but a red zone interception by the SLAM’s Nichols resulted in a turnover that placed the hostesses at their own 31-yard line with 6:30 left in the half. On St. Louis’ next snap, quarterback Jaime Gaal connected with Neutzling for a 69-yard touchdown haul. Hay’s converted kick pushed the score to 28-8. On the ensuing kickoff, Madison bobbled the ball and the SLAM’s Pugh recovered the pigskin at the Blaze’s 25. Two plays later, St. Louis rookie Mary Altepeter claimed her first post-season score, a six-yard scamper with 5:45 left that resulted in a 35-8 lead. St. Louis quickly regained possession and kept the momentum rolling with Nichols’ 54-yard touchdown catch from Gaal with 3:50 remaining that pushed the score to 42-8 following Hay’s successful kick. Deep in the frame, the SLAM’s offensive line, paced by Caitlin Erickson ,Tammie Moore, Marion Ball, Juan Snow, Cayci Eichmeyer and others, continued to display their dominance and helped Hay collect her second score of the night, a 30-yard scramble with 1:45 left that lifted her squad’s lead to 48-8. 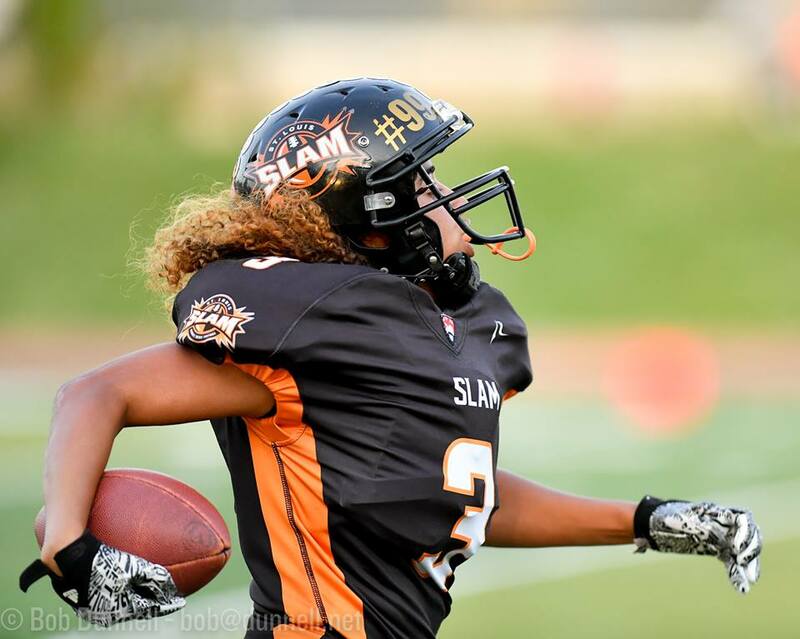 The SLAM’s 34-0 second-quarter push gave the squad a comfortable 40-point margin at intermission and the second half’s opening kickoff return into the end zone extended that ease as Natasha Owens’ 65-yard return helped blossom the locals’ lead to 55-8. Surprisingly, that would be the lone score of the third quarter as the SLAM maintained the 47-point differential heading into the final frame. 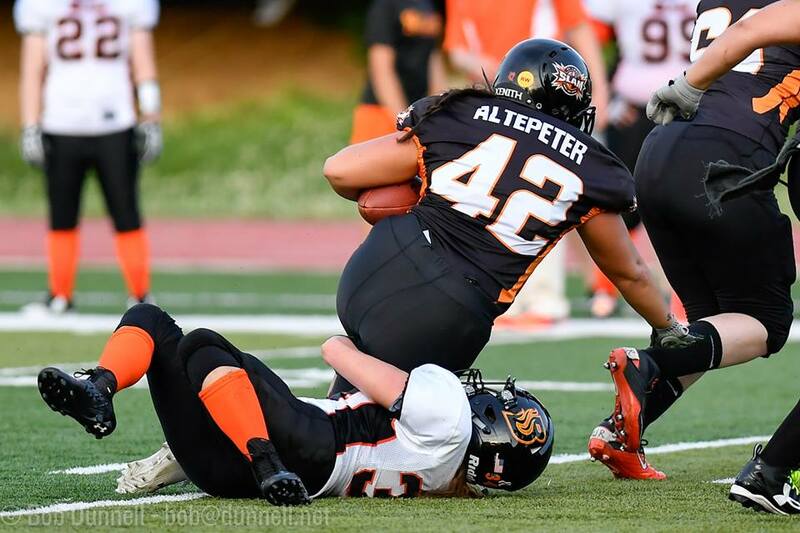 St. Louis notched a pair of lengthy six-point romps, Hay’s 47-yarder with 13:10 left and Altepeter’s 60-yard rumble with two minutes left, that dotted the exclamation point in the SLAM’s 69-8 WFA Tier II quarterfinal victory. The seasoned veterans that have been affiliated with the 14-year-old franchise are impressed with the current complexion of the team and their potential future. Hay paced the offensive ledger with three touchdowns off of 173 rushing yards. The SLAM anticipates a high-intensity battle against Mile High and will prepare accordingly. 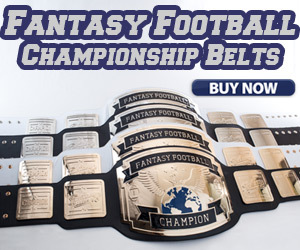 A double dose of football drenchers against teams that possess the”Blaze” moniker is the missive. RUSHING: Hay 9-173, 3 TDs. Altepeter 9-121, 2 TDs. Price 2-38, 1 TD. Webb 2-38. Smith 1-9, 1 TD. Owens 1-9. Nichols 1-5. Morrow 2-2. RECEIVING: Neutzling 1-69, 1 TD. Nichols 1-54, 1 TD. Hay 1-2. PASSING: Gaal 3-8, 125 YDs, 2 TDs, 0 INT. PAT KICKING: Hay 7-8. Neutzling 2-2.